Last year we shared with you attempts in Washington D.C. to repeal the Johnson Amendment. This is the provision of the federal tax code that protects charitable, religious, and philanthropic organizations from getting involved in candidate endorsements. The National Council of Nonprofits had led the charge to save this important provision, and we’re proud that Alaska nonprofits have stepped in, too, to let our delegation know about the danger of repealing this long-standing protection from partisan politics. Another attempt is underway this month to once again repeal the Johnson Amendment. Some congressional leaders hope to consolidate a huge array of legislative proposals into a massive bill to be passed by March 23 that would provide funding for the rest of the fiscal year. (See article below.) And one of the riders being considered would repeal or weaken the Johnson Amendment. If that rider is attached, it will be virtually impossible to stop passage. Again, we strongly encourage Alaska nonprofits to “use their voices” and speak out against this attempt. Call or email our delegation. 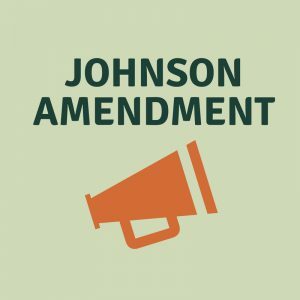 Let them know that you oppose any move to repeal or weaken the Johnson Amendment. If you haven’t already, sign the community letter in support of nonpartisanship. It’s easy. Here’s the link. Pass it along to your colleagues after you have signed. Write an op-ed or letter to the letter of your local newspaper. These will get the attention of our delegation. Here’s a sample of letters from across the country. Here at Foraker, we will keep up the pressure, too. Here’s our official statement on this critical issue. For more information, contact Mike Walsh, Foraker Vice President and Director of Public Policy, at mwalsh@forakergroup.org.